We usually respond within 24 hours on weekdays. Auto Darkening Welding Helmet, Lens Shade 4, 9 to 13, Graphics None, Color Black, Plate Height 1-9/16 In. Viewing Area 5.8 sq. Headgear Ratchet, Classic Series, Material Nylon, Grind Mode Yes, Number of Arc Sensors 3, ADF Controls Knobs, Power Source Battery and Solar, Battery Type Lithium, Battery Life 2000 hr. Electromagnetic Sensor No, Switching Speed 1/15, 000 sec. 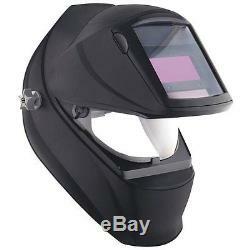 Price For: Each Headgear : Ratchet Material : Nylon Item : Auto Darkening Welding Helmet Includes : Lithium Battery, Magnifying Lens Holder, (5) Outside, (2) Inside Cover Lenses Features : 1/15, 000 sec. Lens Speed, Sensitivity and Delay Control 0.10 to 1.0 sec. Plate Height : 1-9/16 Graphics : None Electromagnetic Sensor : No Standards : ANSI, CSA Switching Speed : 1/15, 000 sec. EN379 Classification : 1, 1, 1, 2 Series : Classic ADF Controls : Knobs Power Source : Battery and Solar Number of Arc Sensors : 3 Grind Mode : Yes Lens Shade : 4, 9 to 13 Color : Black Plate Width : 3-3/4 - Country of Origin (subject to change) : South Korea. Welding Helmet, Auto Darkening, 1-9/16in. The item "Welding Helmet, Auto Darkening, 1-9/16in. H" is in sale since Sunday, March 05, 2017. This item is in the category "Business & Industrial\Manufacturing & Metalworking\Welding & Soldering\Welding\Welding Protective Gear\Welding Helmets".av" and is located in US. This item can be shipped to United States.